In a potential playoff preview between the Blackhawks and Stars, who would have thought the game-winning goal would be scored 102 seconds into the contest. The Blackhawks extended their record to 6-1-1 since the trade deadline, and the key players were big once again. Patrick Sharp was credited with that game-winner, which was the Hawks’ second goal in the first two minutes of the game. He also scored the Blackhawks fourth and final goal in the 4-1 victory, keeping him tied with Marian Hossa at 28 goals on the season; Hossa’s 28th was the third goal of the evening. The first goal of the game came from Dave Bolland only ten seconds into the contest. Chicago’s third period almost mirrored the first. The Hawks scored two goals in the first 1:42 of the first period, and scored two in the first 1:45 of the third to blow the game wide open. Viktor Stalberg was credited with an assist on each of Sharp’s goals. Patrick Kane, Johnny Oduya, Andrew Shaw, Brent Seabrook and Bryan Bickell were also credited with assists in the game. Shaw led the team with four blocked shots. In net, Corey Crawford came back with an outstanding start. He stopped 21 of 22 shots in the game and stayed strong with the puck in the midst of some physical traffic at times. Dallas clearly was trying to copy the plan employed by the St. Louis Blues, out-hitting the Hawks 41-14 in the game. But the Stars were too focused on hitting and not enough on actually playing hockey in the game, and it ultimately cost them. The Blackhawks didn’t score on four power play opportunities, but to their credit didn’t take a penalty despite receiving a number of big hits. Steve Ott was credited with nine hits for the Stars, and appeared to be content with trying to hurt someone rather than playing the game for most of the night. He was minus-one in the contest. Brent Seabrook had a strong night on the back end, including a bit hit on Ott behind the Hawks’ net. He was credited with three hits, two takeaways and one blocked shot in over 25 minutes of ice time. Indeed, the ice time for the Blackhawks defensemen on Friday night is probably the ideal for the team as the playoffs approach. Both Seabrook and Duncan Keith were held under 26 minutes and Johnny Oduya skated just over 24 in the game. Nick Leddy was under 19 minutes, Niklas Hjalmarsson was under 16 and Dylan Olsen was held under nine minutes on the night. In their run of solid play since the trade deadline, the Hawks have outscored their opponents 23-20, and have held opponents to fewer than 30 shots in six of the eight games. In their last four games, the Hawks have allowed only 100 shots on net and just nine goals (not including Mike Richards’ shootout game-winner for LA). Crow is so much better when he doesn’t flop around like a fish out of water. Speaking of fish… has anyone seen Turco subbing in goal in Boston… wow is that bad!!! It appears Crow has re-learned the position… when he lost sight of the puck, he didn’t panick and flop… he just stayed big and cool- hope that stays around for a while. I really wanted a shutout tonight…ONE for the year would be nice and a further confidence booster for CC. Too bad he lost it tonight on a giveaway. The basis for the Hjalmarsson article wasn’t the team’s record by improvements in key statistics that indicated he wasn’t being missed on the ice. If I was to do the same with Toews, I would have to point out that the team’s three primary faceoff men in the last 12 games – Kane, Bolland, Kruger – are all winning under 47% of their faceoffs over that stretch. If you’re honestly asking that question, you need to buy a clue. Regardless of what the hawks do with Kane… the entire team faceoff % has been brutal, except Toews. Besides the special teams, the hawks MUST improve on this category. The combination of Bolland, Kruger and Kane…. uggg! I like their ability to skate at the centerman position… but losing control of the puck also contributes to the defensive problems. It might be worth mentioning that Billy Beane’s sh*t doesn’t work in the fyolapfs and Moneyball is necessary for small town baseball teams and not large city hockey teams. It might also be worth mentioning that Tab doesn’t think he is god. 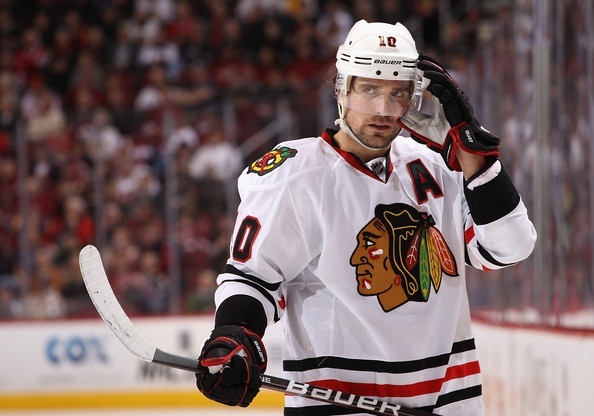 God knows Adam Burish is bad. Bowman has not done well in building the kind of team the Hawks should be but by no means has he done a bad job. The team should be better on defense and should have built toughness by adding talent. More Jamal Mayers, less Daniel Carcillo and no John Scott. The Hawks’ farm system is one of the best in the league and has kept the core of great hockey players that won the Cup yet some fans still are blinded by the house-cleaning that HAD to take place in the summer of 2010. Stan Bowman is not the best GM in hockey but he is above average. This loss does not solve all of Hawks’ problems and the team needs help on D. The Hawks are in good hands with Bowman and with his dad on hand, fans are short-sighted to want him launched. Keep writing, Tab. The blog is great.